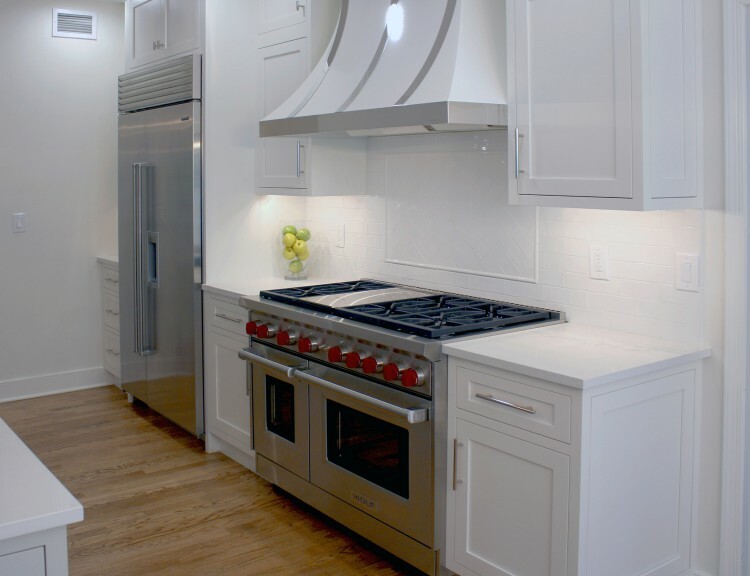 Whether you're looking for an increase in space or to remodel an existing area, A&E's kitchen renovations will enhance the look and performance of your kitchen with effective design and artisan skills. Our design team is specially trained to help you overcome the space obstacles of your kitchen and improve its functionality. 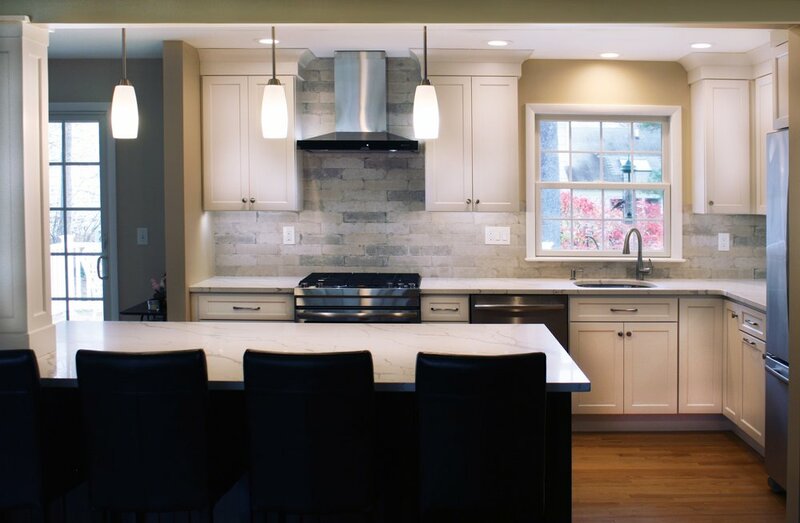 Our kitchen remodels cater to your personal needs and style; whether you favor a contemporary aesthetic and open floor plan or a more traditional look, A&E Construction has the experience needed to produce your ideal kitchen. For a further unique and handcrafted look, A&E's stunning cabinetry features smart and functional design with detailed finishes. 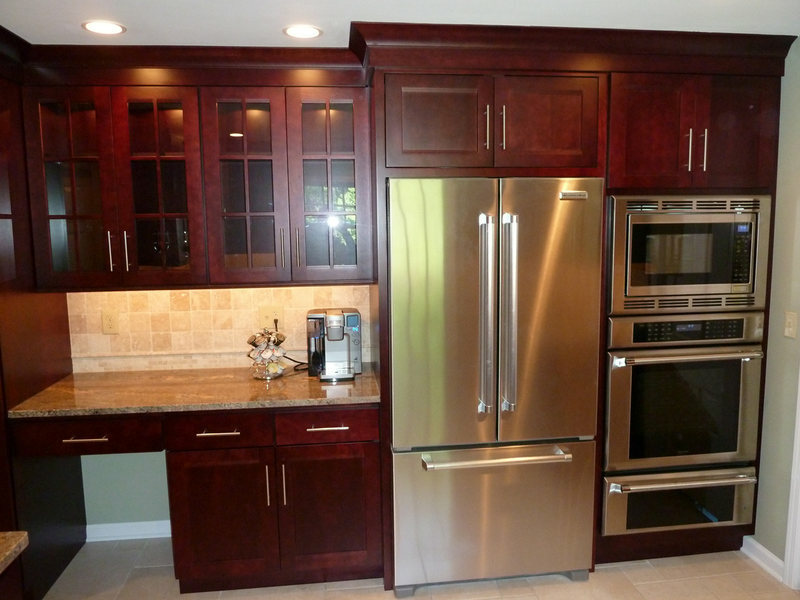 Check out our kitchen remodels to see what A&E Construction can do for you. Multi-room interior renovation. 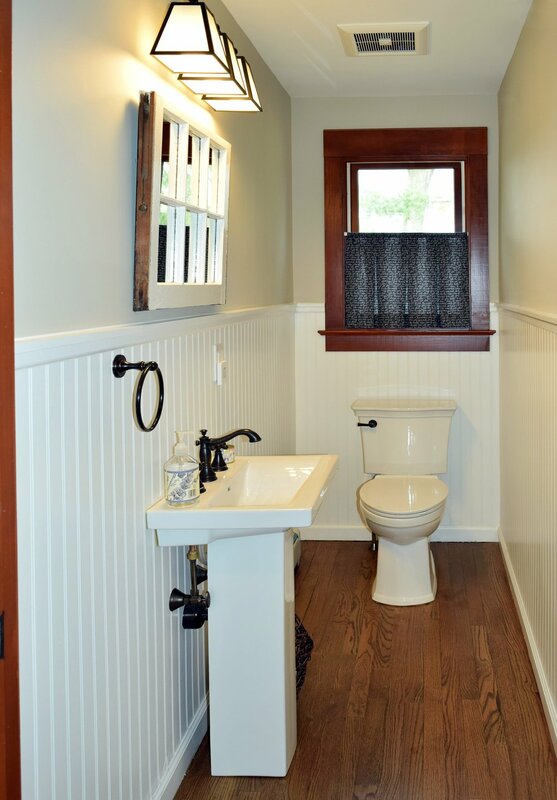 Our clients made beautiful selections throughout for their Craftsman style home. Kitchen includes, crisp, clean white shaker cabinets, oak wood flooring, subway tile, eat-in breakfast nook, stainless appliances, calcatta grey quartz counterops, and beautiful custom butcher block. 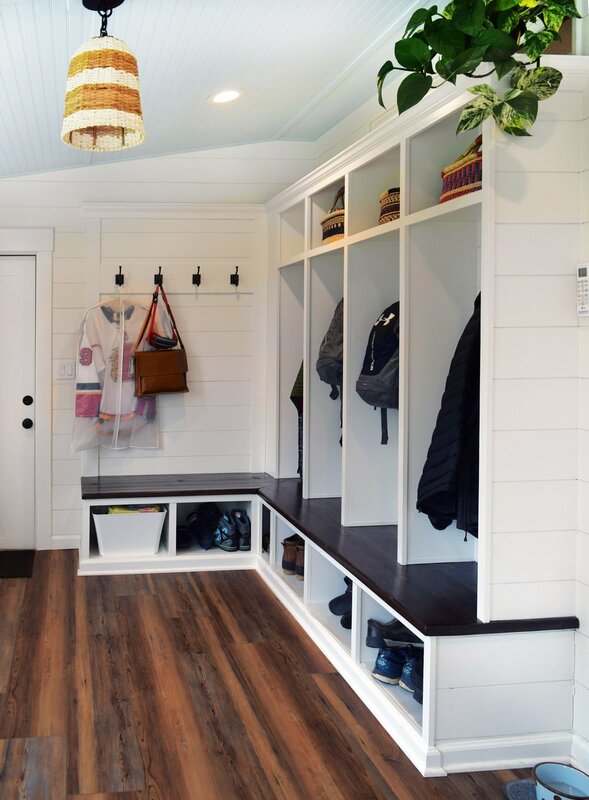 Back porch converted to mudroom with locker storage, bench seating, and durable COREtec flooring. 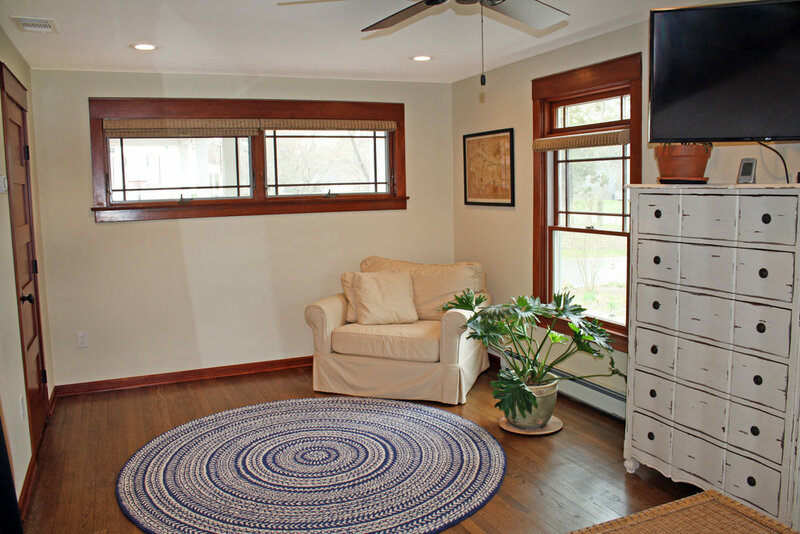 Two smaller bedrooms were converted into gorgeous master suite with newly remodeled master bath. 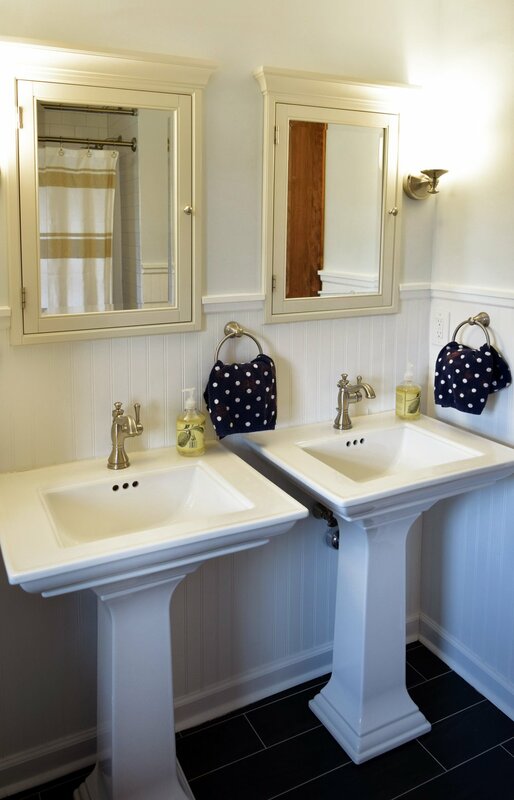 Second story children's bathroom was a complete remodel including double pedestal sinks, porcelain flooring and new fixtures throughout. Townhouse Kitchen Renovation. 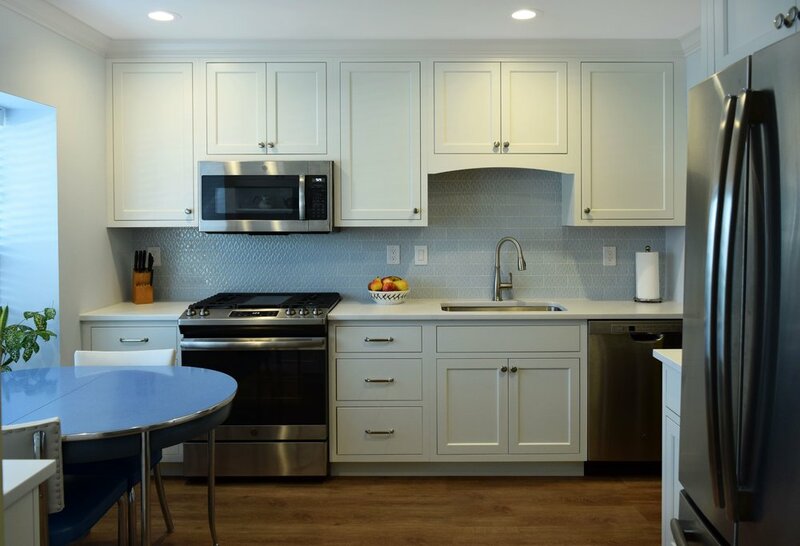 Gorgeous white inset cabinetry, blue ceramic diamond pattern backsplash, silestone countertops, stainless appliances, and durable COREtec flooring give this kitchen the refresh it needed plus provides more functionality for our client. Stand alone bakers rack was replaced with built-in cabinetry for more more usable storage and a place to display treasured items. 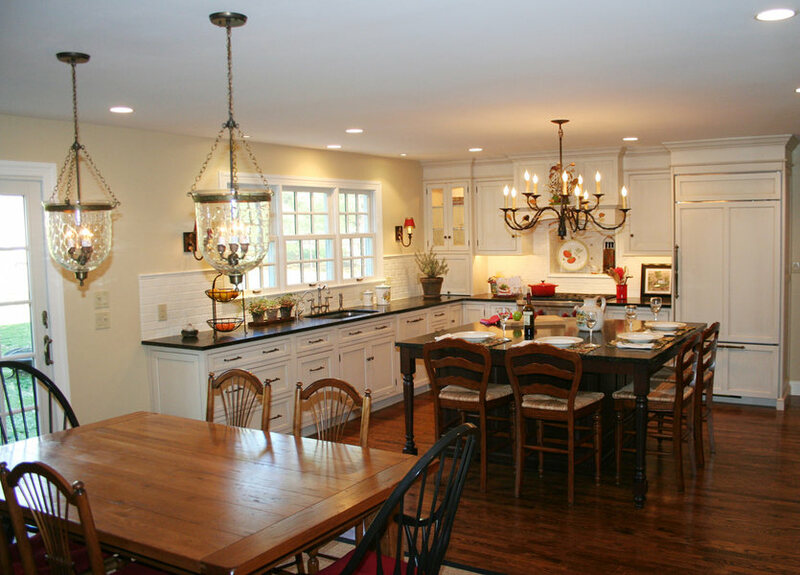 Our clients were looking to create an open floor plan between their kitchen and family room. They also wanted to open up walls to create better flow between the front of the home and dining room. This project included removing walls and installing a structural support beam to give our clients the layout they desired. New custom cabinets, new appliances, quartz countertops, and continuing wood flooring throughout the kitchen completed this project. 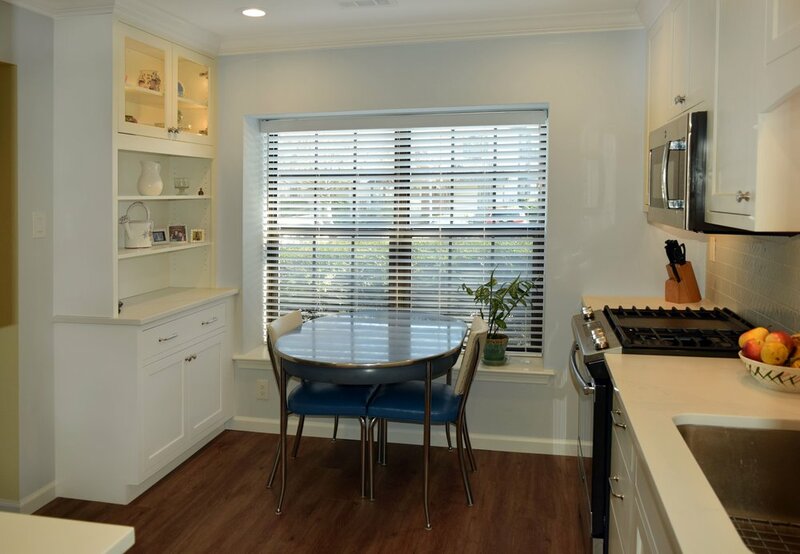 Our clients now have a functional, beautiful kitchen, and the perfect space for entertaining. 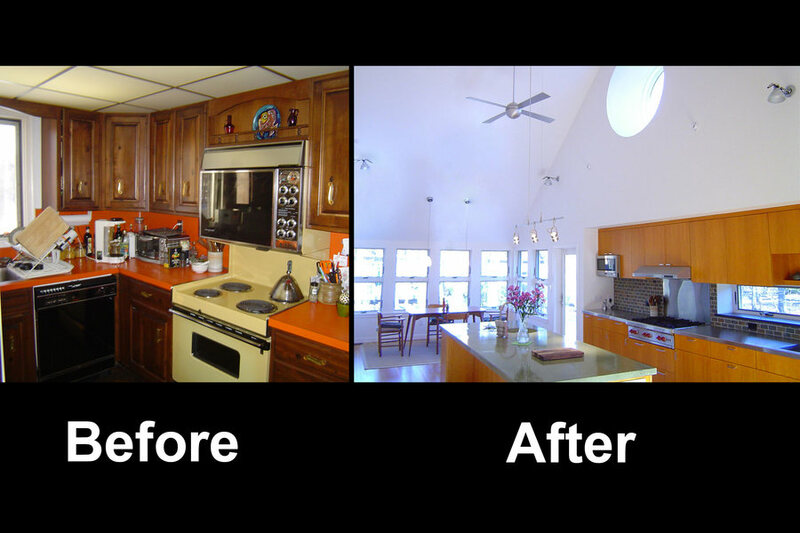 Changing the layout in this kitchen allowed us to create better flow and more function for our clients. 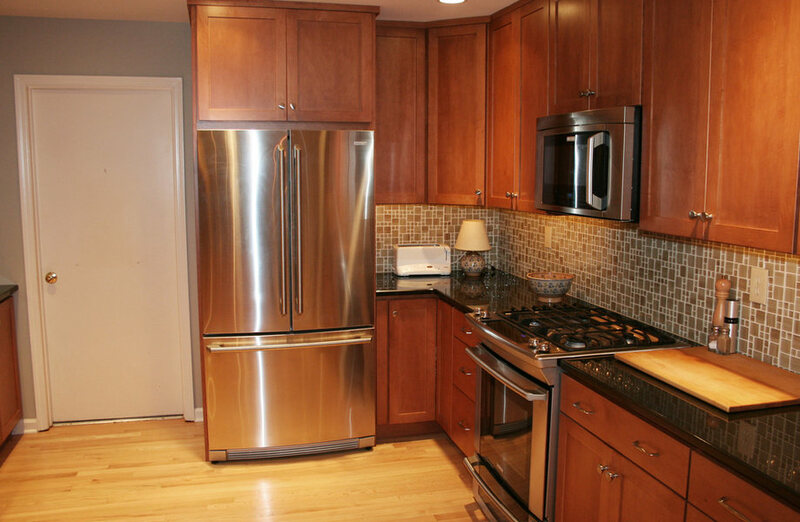 Quartz countertops & backsplash, dark cabinetry, new stainless appliances. 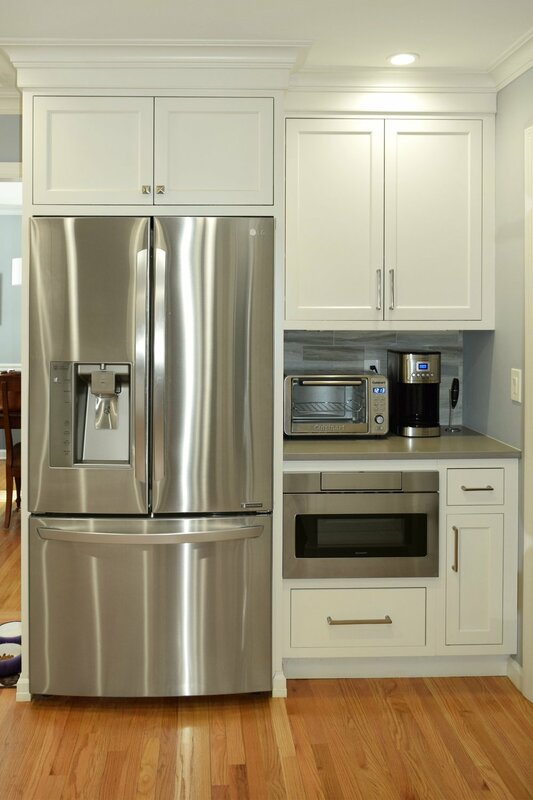 Butler's pantry features Wine Cooler & Beverage Center, refrigerator, ice maker, space for coffee center, and storage. 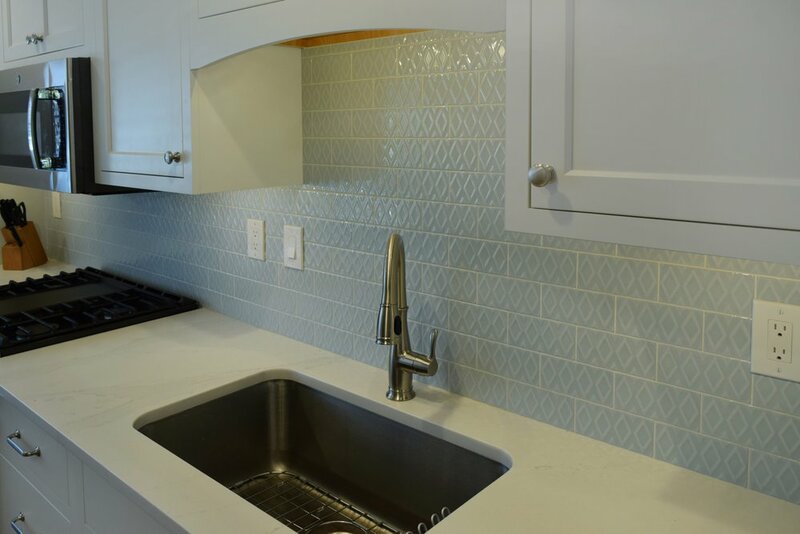 Gorgeous blue glass tile backsplash. 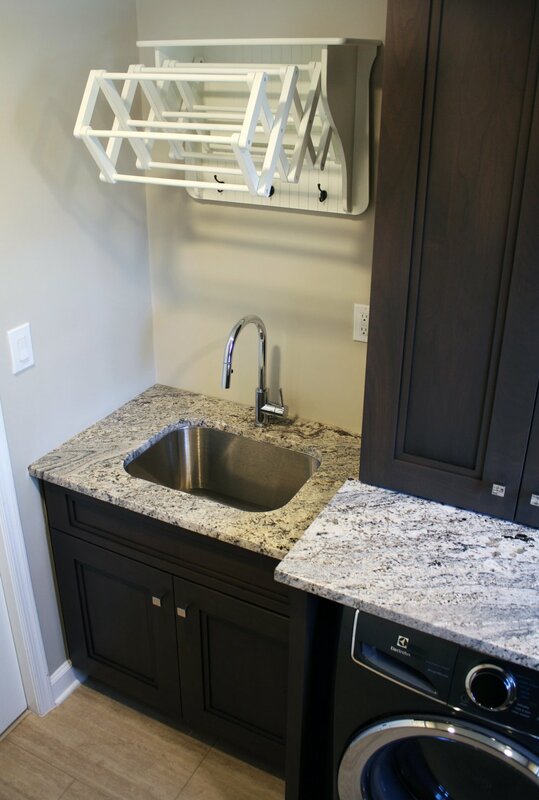 Mudroom Laundry Room features custom cabinetry, sink, drying rack, built in bench with storage for coats & shoes. 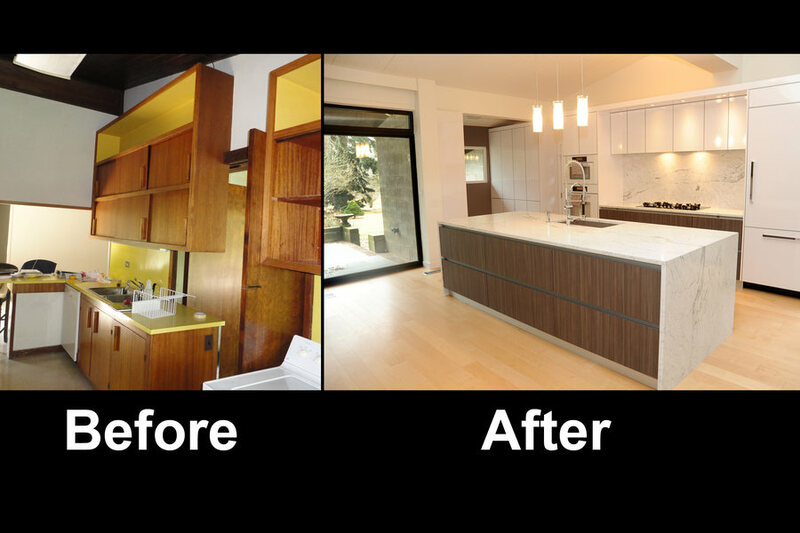 Our clients were looking to update and bump out their existing kitchen to create more functional space. Beautiful white cabinetry, granite counter tops, classic subway tile, and stainless appliances give this kitchen a crisp, clean look. 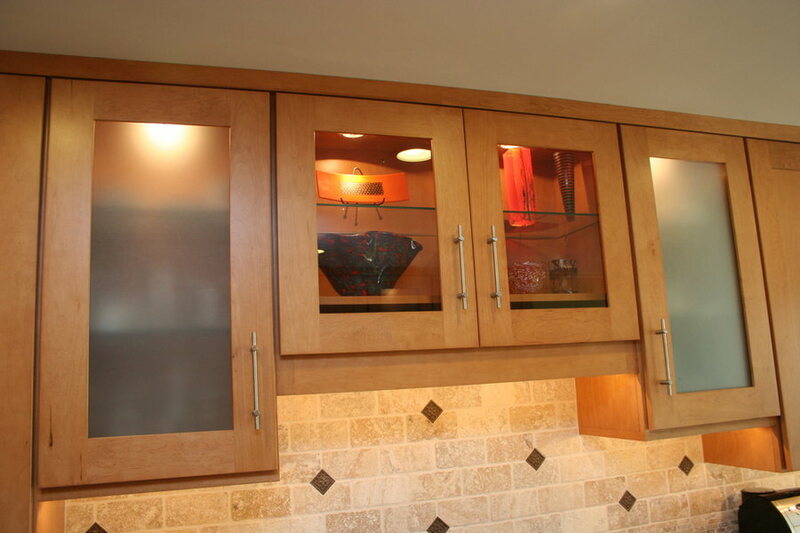 Built-in hutch with display cabinets and wine rack provides additional storage. 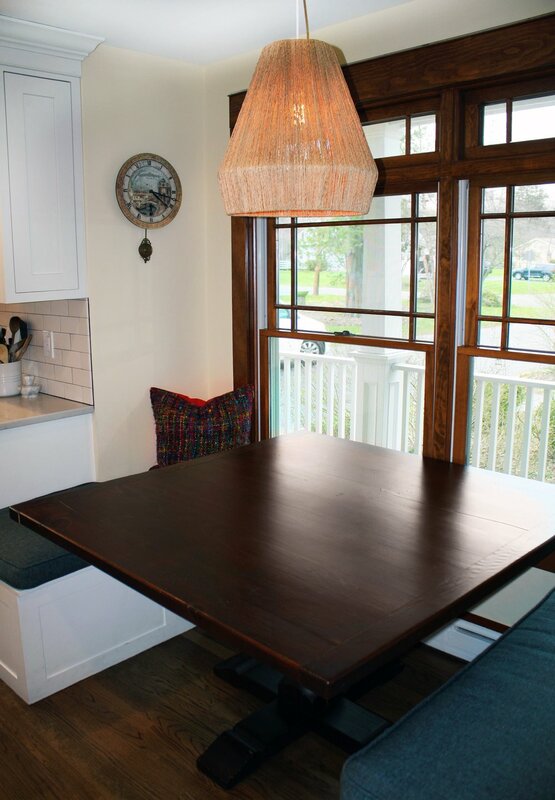 Large eat in table, along with island seating makes for a great gathering space! Dream kitchen! 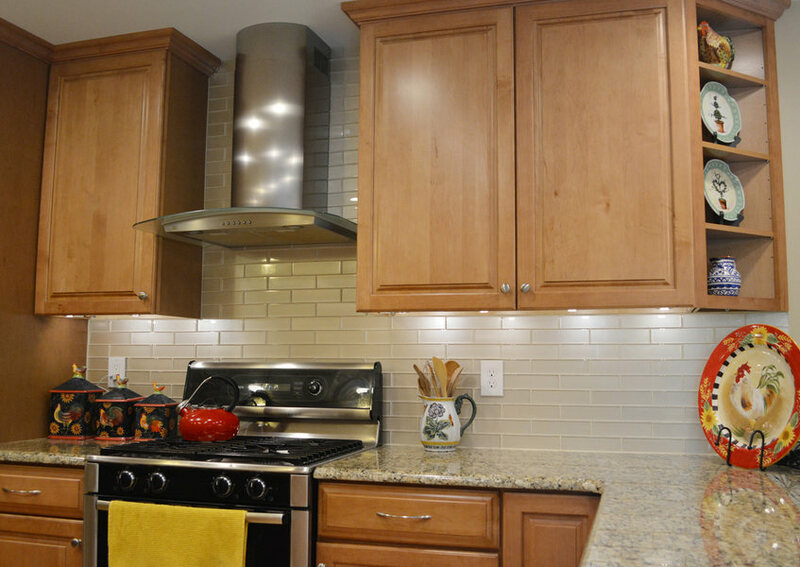 Our clients were ready to update their kitchen and increase its functionality. 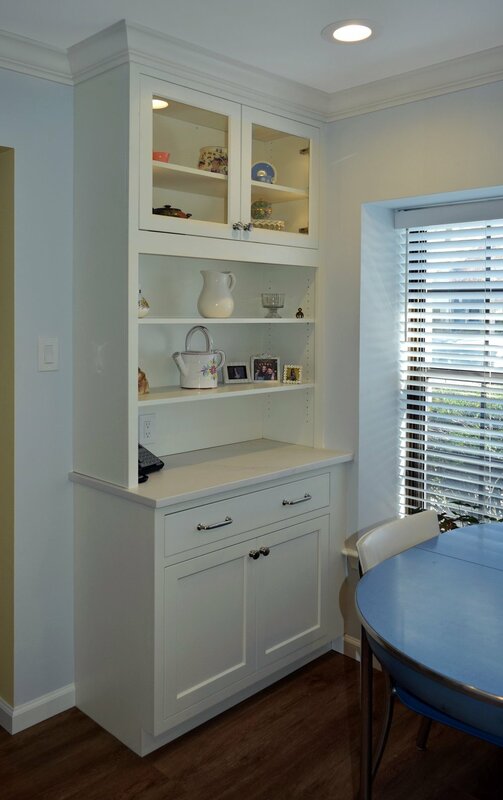 We removed the small eat-in area and extended cabinetry along the back wall. An over-sized island works for gathering, dining, and prep. Island includes under-counter microwave and beverage center. 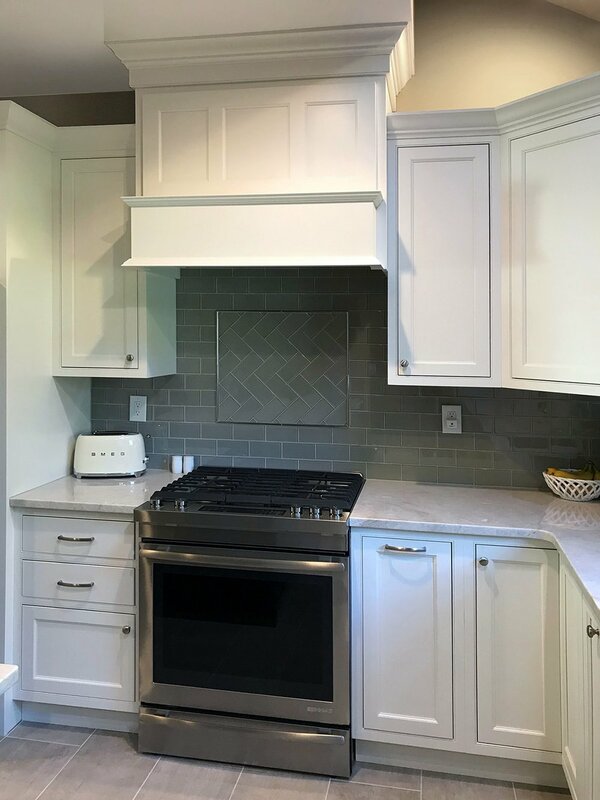 Beautiful custom cabinetry and range hood, stunning quartzite countertops, glass subway tile including a herringbone detail with metal listello above the range complete this update. Our clients were ready for a change! 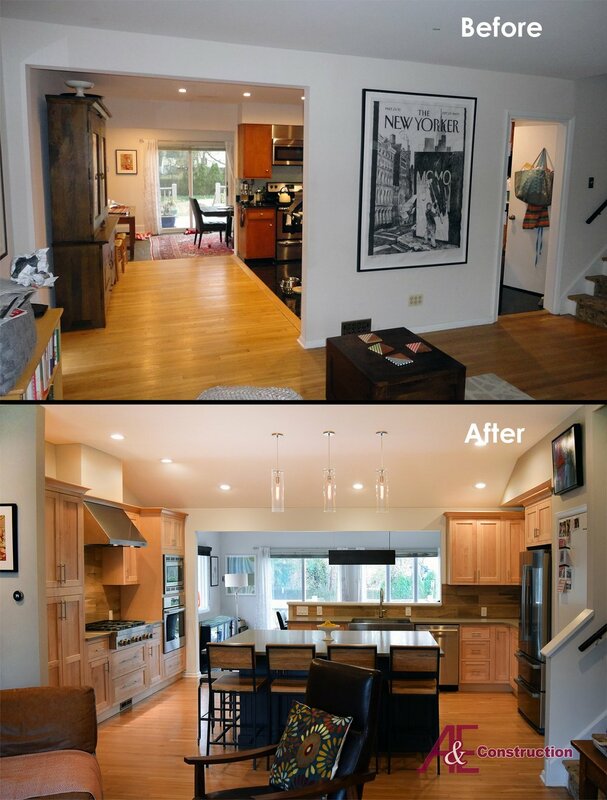 By removing the wall between the existing kitchen and front living space we created a wonderful open floor plan. The large island is the perfect place for prepping food, dining, and features storage on both sides! 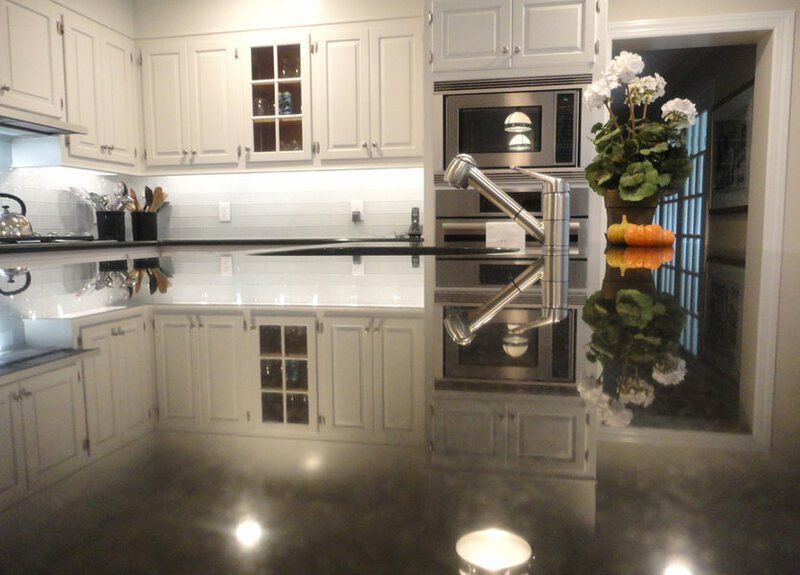 Our clients chose beautiful finishes and appliances including stunning quartz counter tops. What a transformation! 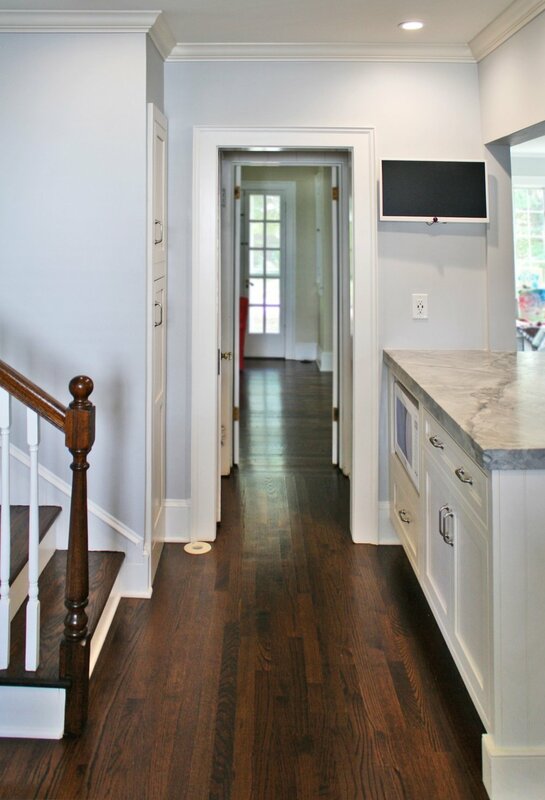 By removing the wall between the existing kitchen and front living room and vaulting the ceiling, we created the open floor plan our clients desired. 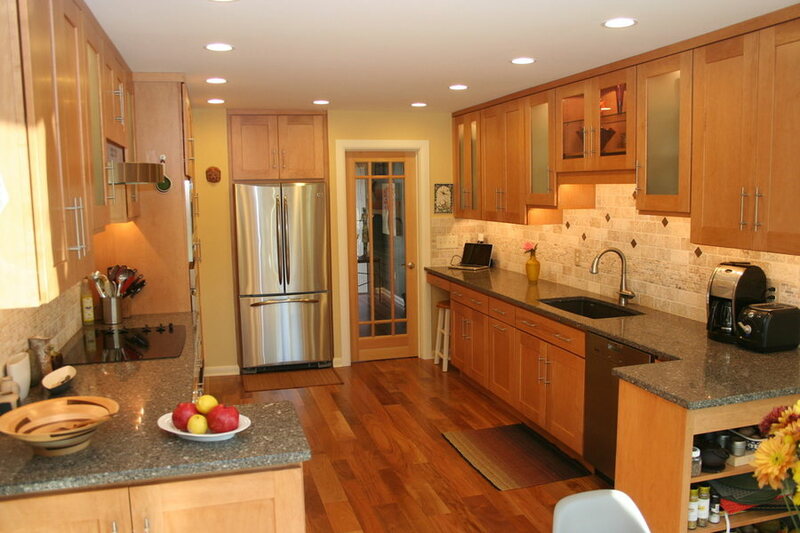 An extra wall of cabinetry, over-sized center island, and new appliances increases the functionality of this kitchen. 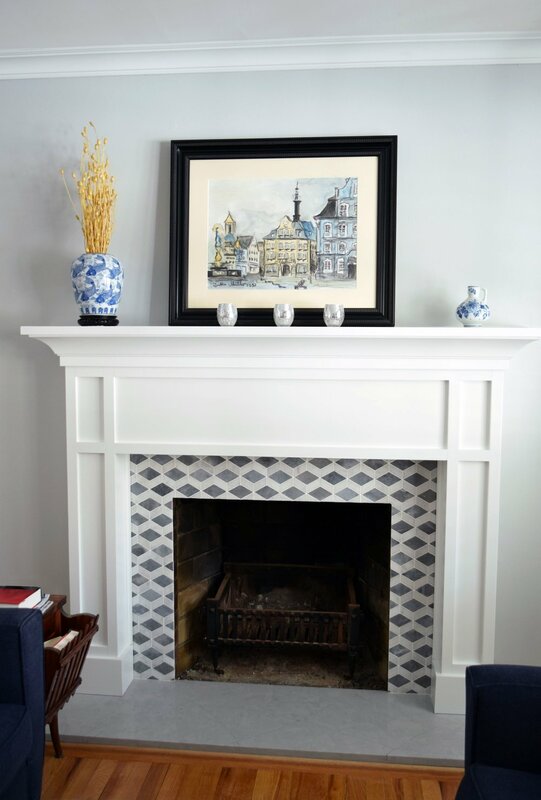 We also updated the fireplace with a new surround and built-in bookcases. 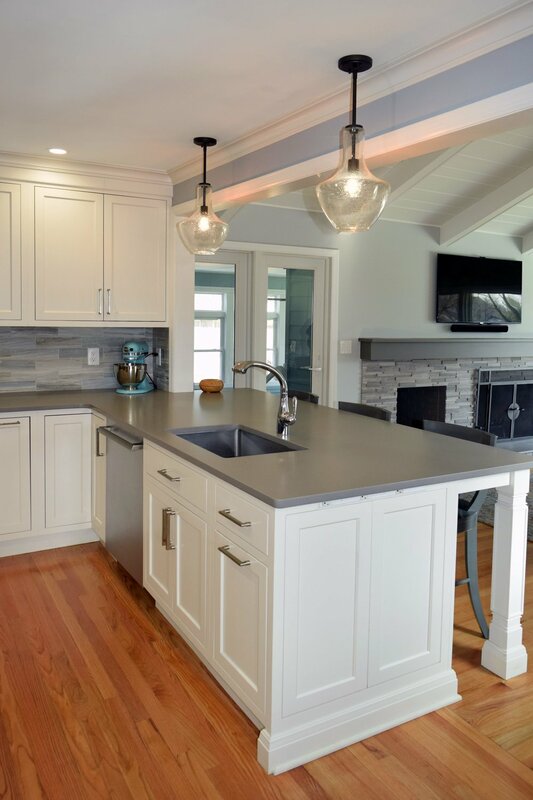 This stunning Pennington, NJ kitchen renovation combines elegance and functionality, blending quartz countertops and walnut finished hardwood flooring with stainless steel appliances and a large eat-in island with seating. The new open space encourages casual interaction into the living area not restricted by old ceiling-mounted cabinets closing off the kitchen. 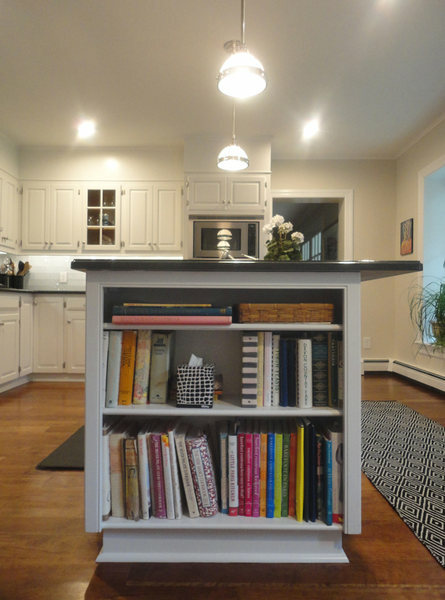 The larger island counter design allows for continuous hidden electrical outlet plug-moulding in the apron detailing, for easy laptop computer charging, and/or appliance usage. This once dated, dark space is now a bright, airy kitchen with built-in refrigerator, gorgeous farm sink and stunning quartzite counter tops. Adding more storage space, efficient lighting, and new appliances increases the functionality of this warm and welcoming family kitchen. 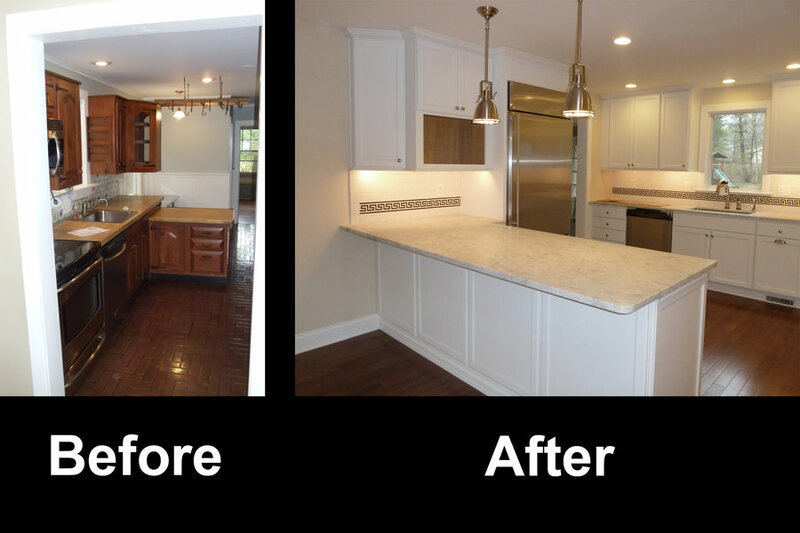 This Princeton kitchen remodel was part of a larger, full-home interior remodel in which we gutted an existing structure in order to design and construct a more contemporary interior in accordance with the clients' tastes. Here you see the kitchen area and pantry, featuring a waterfall countertop island, a marble slab backsplash, a walk-in pantry area, and sleek custom cabinetry throughout. 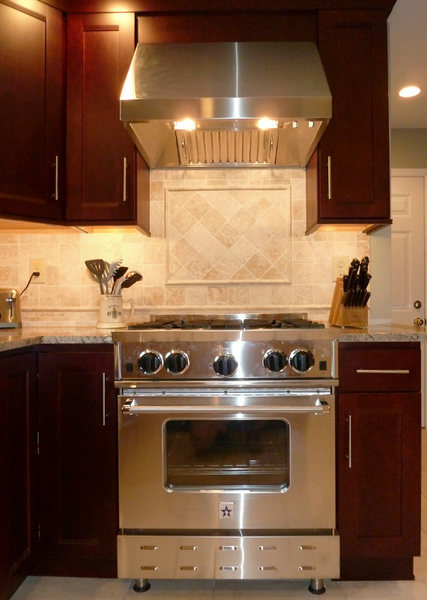 Our Pennington client had recently moved into this home and was dissatisfied with the way the kitchen functioned. As it was before, the kitchen was closed off from the rest of the home with the single entrance being on the far end of the main first-floor hallway, next to the door to the garage. 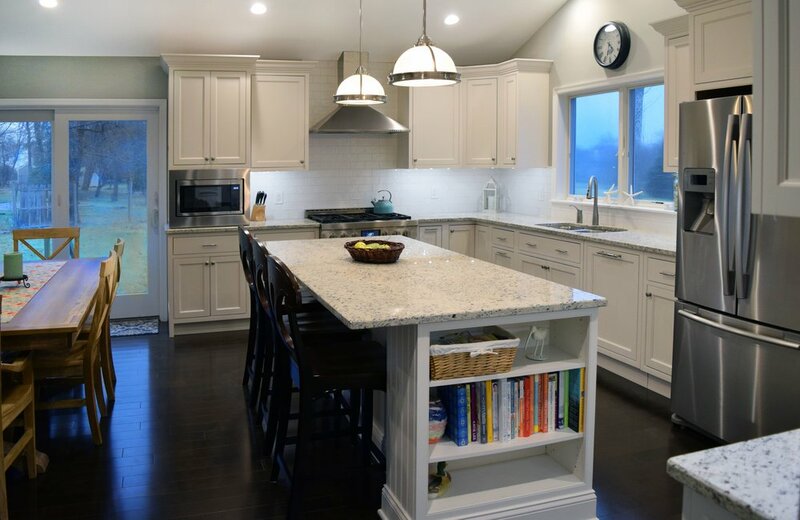 A&E Construction developed a design for her kitchen remodel that both creates a better flow between the kitchen and the rest of the house, and also offers a better option for eating/work space. This Pennington kitchen is a more traditional kitchen remodel that provides ample counter space for both food preparation and entertaining. The rich materials of this room-- including swirling quartz countertops, exposed brick, light hardwood floors, and exposed ceiling beams stained a deep amber-- give this kitchen its warmth. 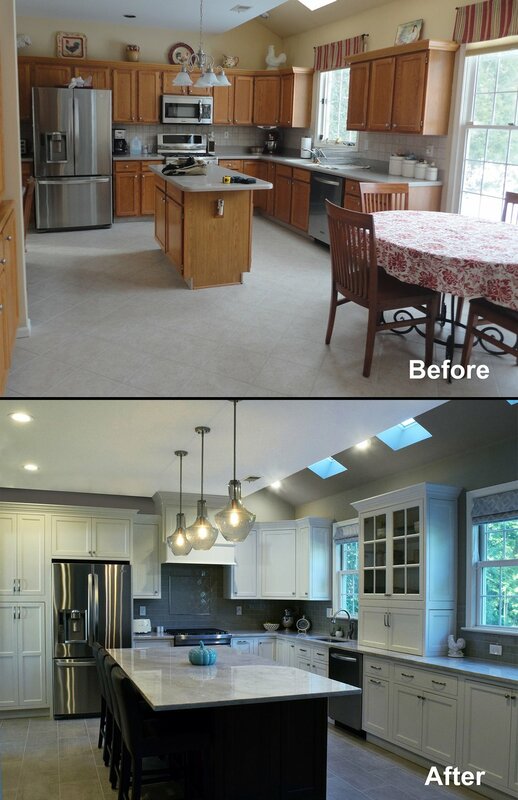 This is an award-winning Pennington kitchen remodel of ours designed in a traditional aesthetic. Several considerations went into the design of this kitchen, including the client's desire for an ideal entertaining space. One element of this is the legged kitchen island, which exhibits the formality of a true dining table while maintaining the functionality of kitchen cabinetry, providing an additional seating area to the adjacent dining table. 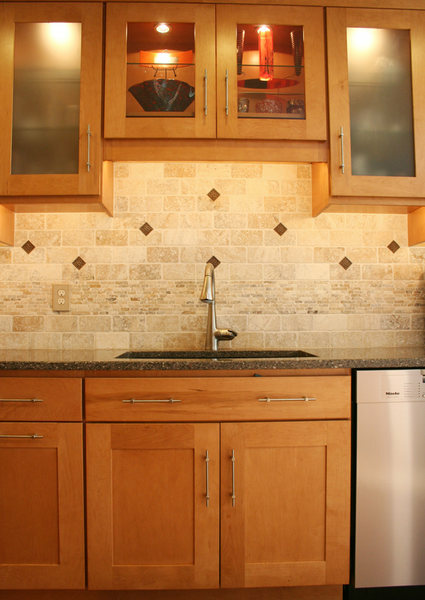 Subtle details like cabinet lighting and high-end cabinet hardware truly set this kitchen apart. This Pennington kitchen remodel uses a unique combination of contemporary and industrial aspects. Concrete and stainless steel countertops give this kitchen its industrial flair, while the sleek custom cabinetry and colorful subway tile assure you that this is definitely not a restaurant kitchen. 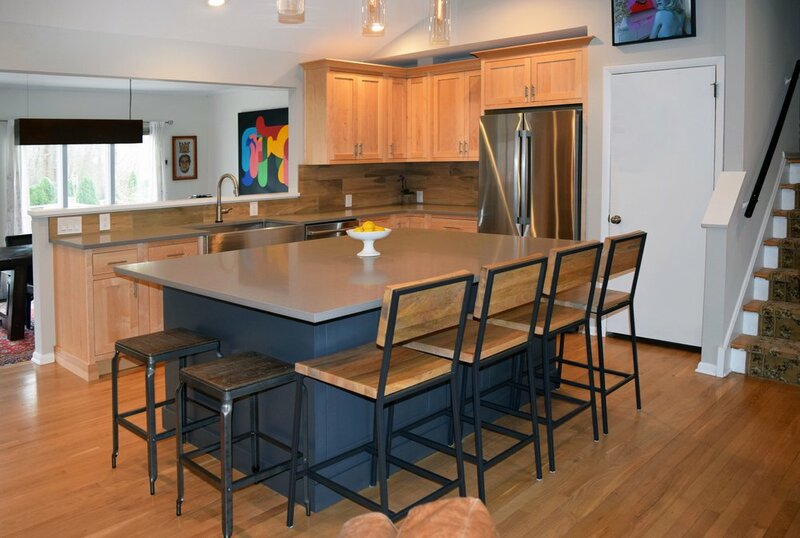 This Princeton kitchen remodel is part of a 2-story addition project, with an eat-in area behind the countertop bar seating being the first level of the new addition. A bit of transitional style comes across in this well-lit kitchen, with a stainless steel hood, sparkling glass subway tile, and contemporary pendant lights really updating the room. 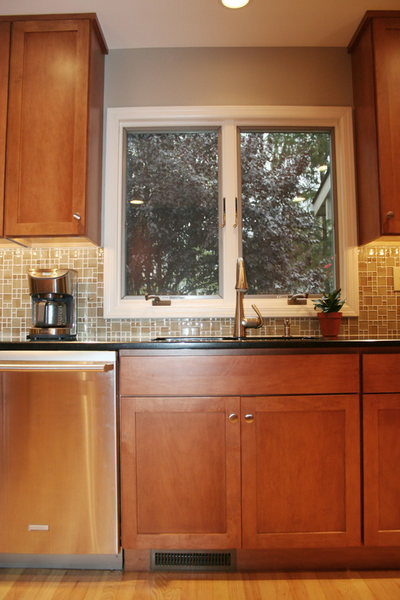 This Princeton kitchen remodel is brightly lit thanks to the extensive use of windows throughout the space. 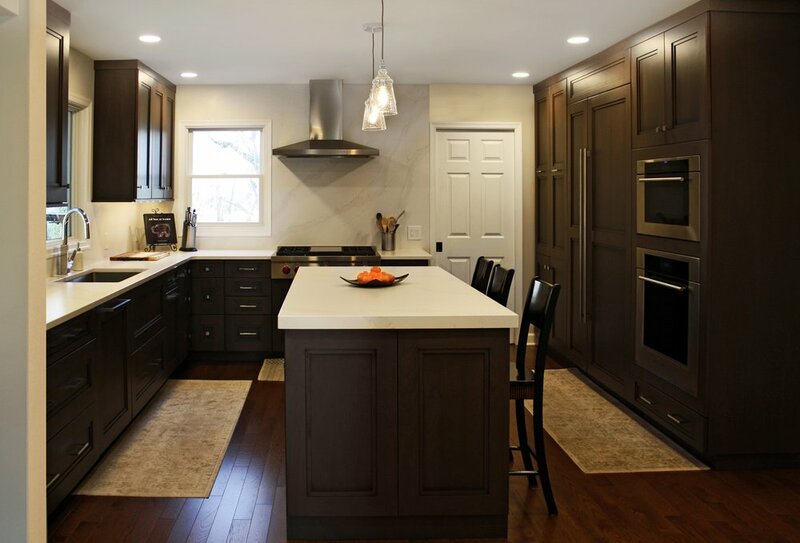 Whether you favor the high contrast black and white aesthetic of this kitchen renovation, or opt for more subtle neutrals, A&E Construction's design and construction teams will help you achieve your remodeling goals. 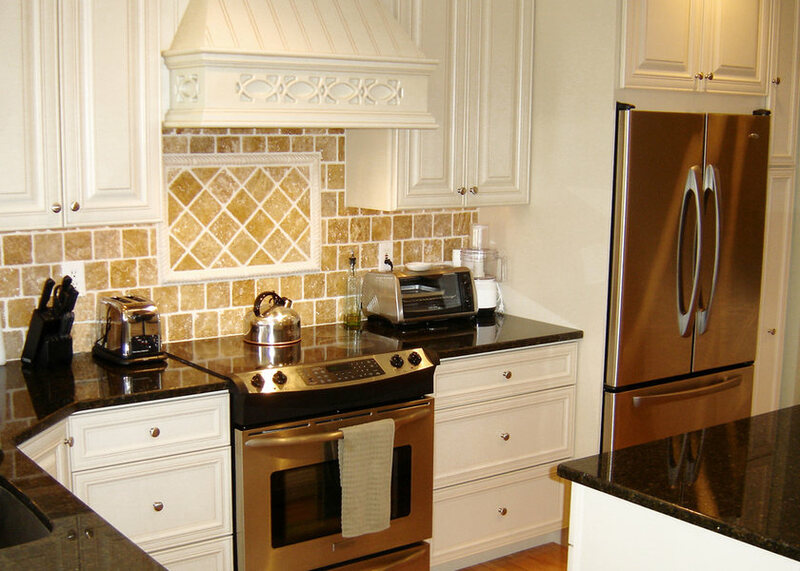 This Pennington kitchen remodel features a host of rich materials, from granite and stained wood countertops to patterned glass tile, that make this new kitchen warm and inviting. 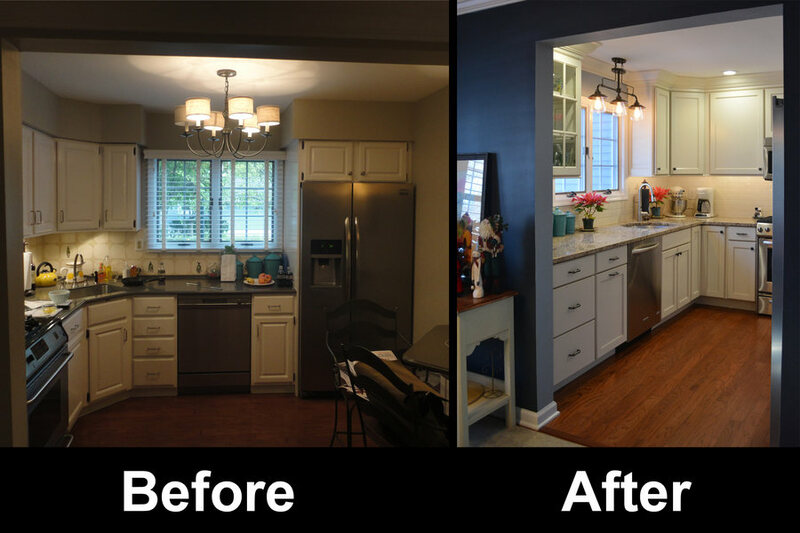 This is an example of a low-budget kitchen remodel where we made several aesthetic improvements to the space at a very minimal cost to the client. 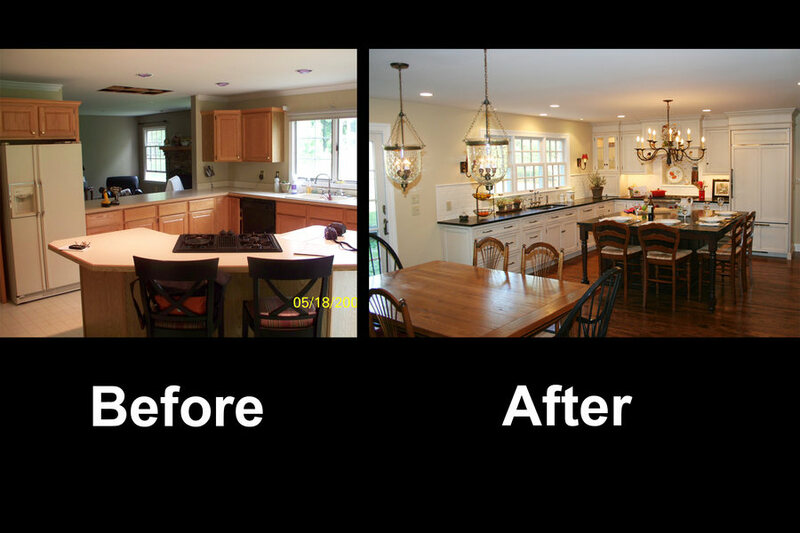 For this project, we were able to preserve the existing cabinets by sanding and refinishing them, then replaced the countertops, light fixtures, and hardware for an upgraded, contemporary look. 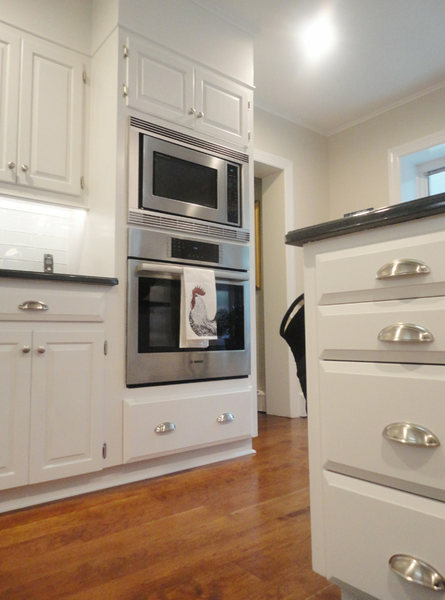 This bright and airy Pennington kitchen remodel is only a portion of a larger home addition project. 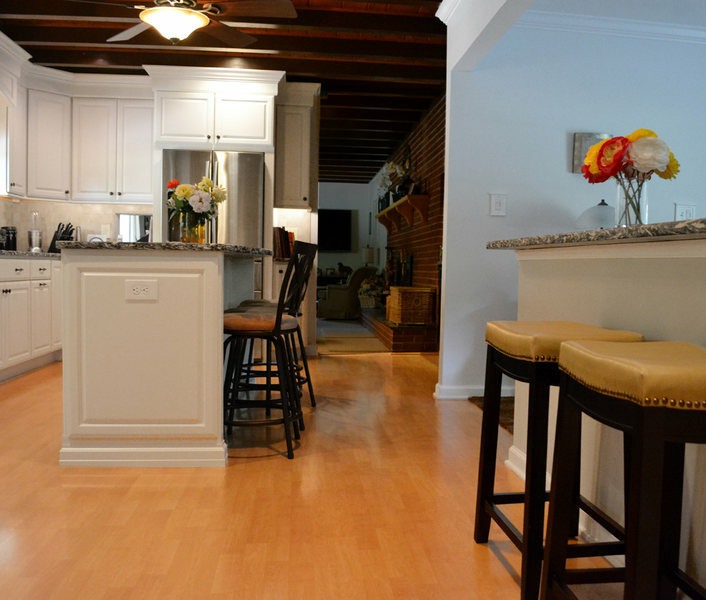 Plenty of counter seating and and open floor plan make this the perfect space for casual entertaining. The angled bar seating of this Pennington remodeled kitchen allows the kitchen area to flow into the adjacent sitting/fireplace area. This creates an ideal atmosphere for entertaining where someone can be finishing up the cooking or grabbing a drink, while still being able to participate in the conversation going on in the next room. 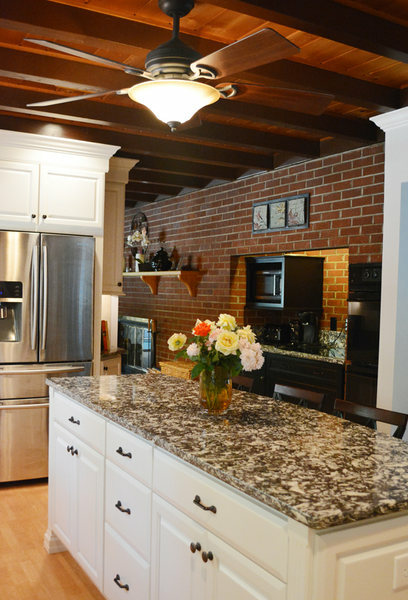 Inset cabinetry, contrasting countertops, and knotty hardwood floors are just a few of the details that give this kitchen remodel its rustic charm. 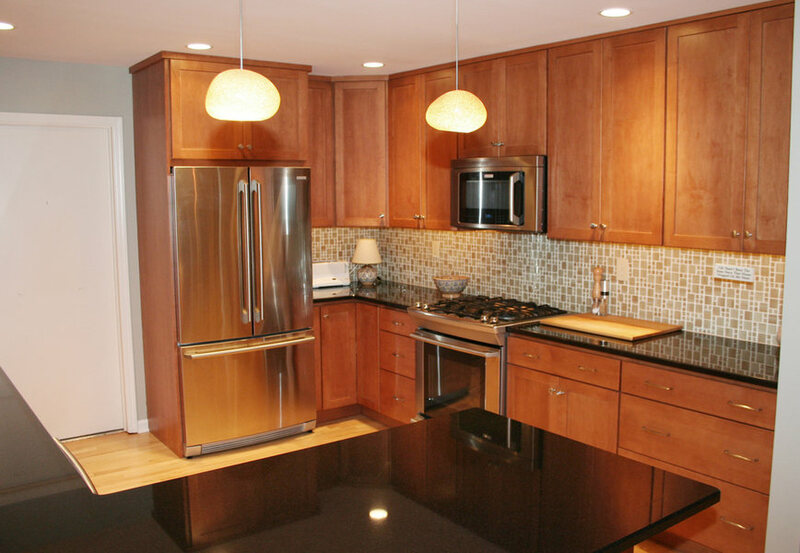 This Princeton NJ kitchen remodel features dark wood cabinets, stainless steel appliances, and granite countertops with an undermount sink. 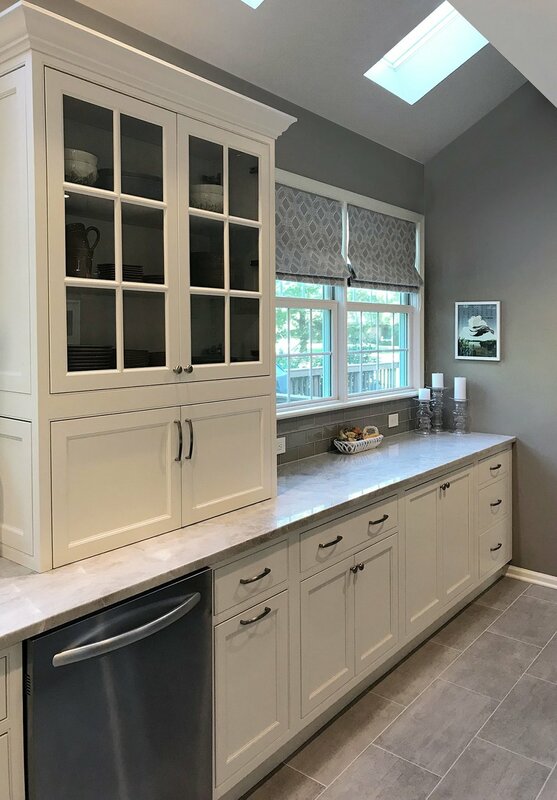 See with this kitchen remodel how a built-in television cabinet and a large central island can make a kitchen multi-functional. The streamlined profile of this richly stained cabinetry and hardware gives this otherwise traditional kitchen remodel a slightly contemporary flair. 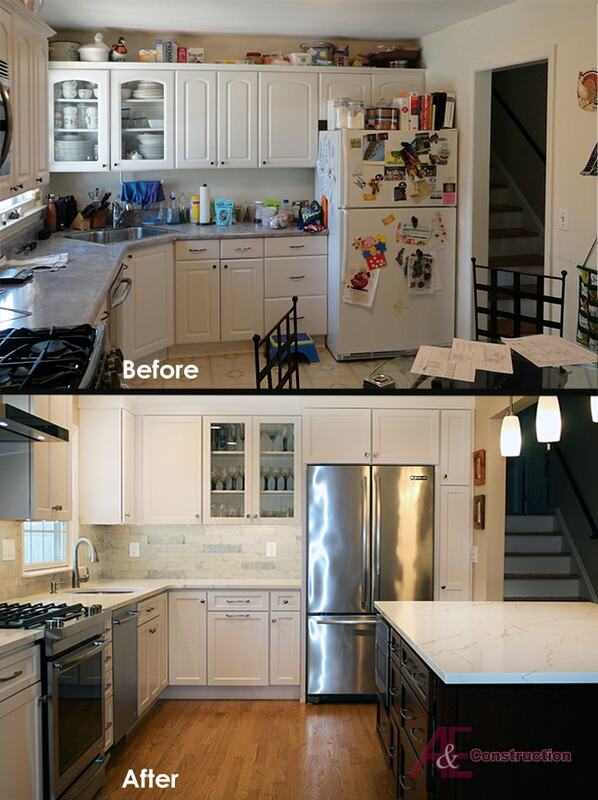 This bright white kitchen renovation was influenced by the client's Greek aesthetic sensitivity. 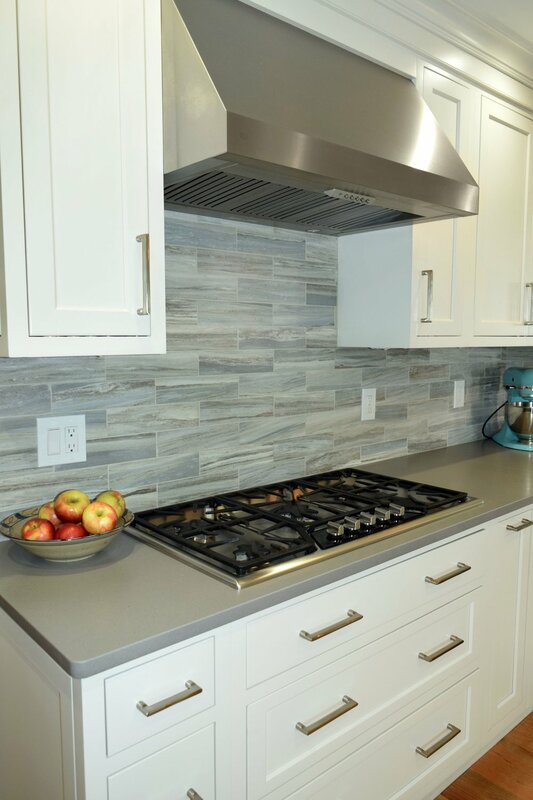 Various accent tiles and patterns give this backsplash plenty of visual texture, while glass cabinets and under cabinet lighting complete the look of this kitchen remodel. This Pennington contemporary kitchen remodel showcases a funky glass backsplash, statement pendants, and a glossy black countertop. 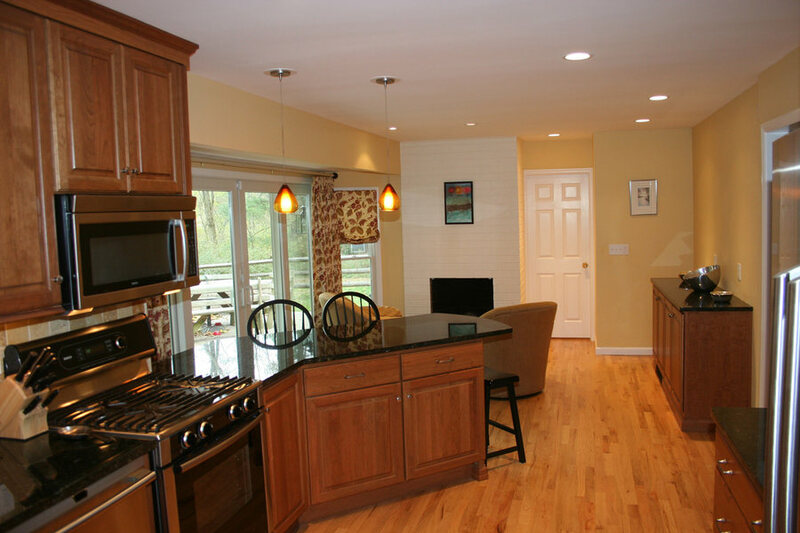 This open floor plan kitchen features a long central island to provide ample space for food preparation. 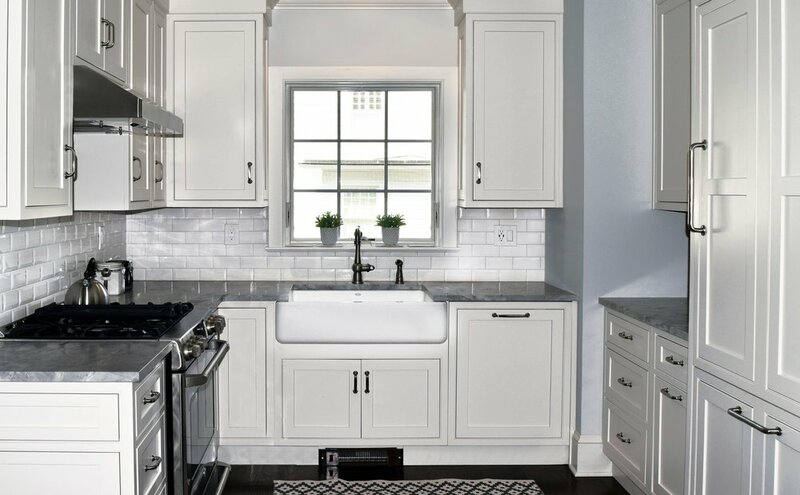 The charming farmhouse sink with vintage style faucet gives this kitchen a traditional touch.